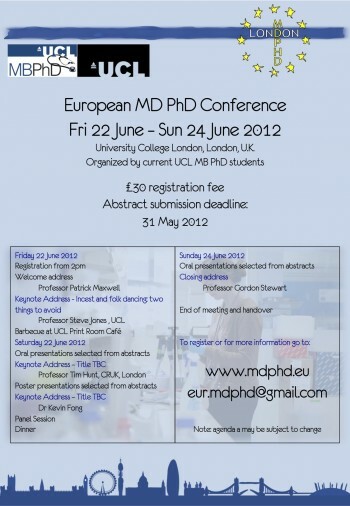 In 2012, the 1st European MD/PhD Conference was organised at the University College London (UCL) in London, UK. MD/PhD candidates from Sweden, Denmark, France, Switzerland, the UK, Portugal and The Netherlands attended and presented their work during poster and oral presentations. Invited speakers at the conference in London included Professor Steve Jones, Sir Tim Hunt, Dr. Kevin Fong and Dr. Charles Swanton. The conference was a great success and laid the groundworks for EU MD/PhD conferences to come.